Beijing Opera in Chinese Culture. Beijing Opera, or Peking Drama (京剧 jīngjù) which is different with speaking Chinese is a tradition Chinese theatre (戏曲 xìqǔ) that has 200 years history (历史 lìshǐ) in China. It says some of Chinese people who speak mandarin Chinese can not understand it totally. It was formed (形成 xíngchéng) in Beijing around the 1800s, therefore was called the “Beijing” opera. 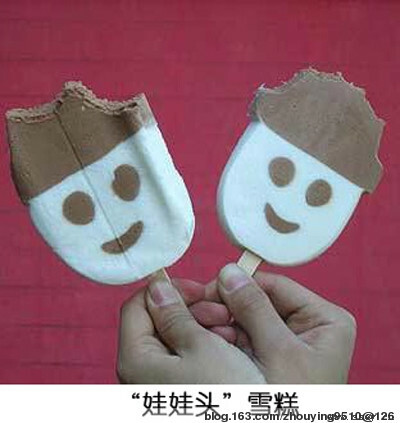 Nowadays, it is loved (喜爱 xǐài) and praised (赞美 zànměi) as the quintessence of Chinese culture (国粹 guócuì). It is a Ban-qiang style (板腔体 bǎnqiāngtǐ) drama usually consisted of melodies of Xi-pi (西皮 xīpí) and Er-huang (二黄 èrhuáng). On the stage, artists will use singing, dancing, and symbolic (象征性的 xiàngzhēngxìngde) movements to present a scene; while the accompany band (伴奏 bànzòu) will use percussion instruments (乐器 yuèqì) and string instruments to give the rhythms (节奏 jiézòu). With the art of symbolism, you won’t see a real horse (马 mǎ) running on stage (舞台 wǔtái), but a whip (鞭打 biāndǎ) by an actor (演员 yǎnyuán) shows that there should be a horse in this scene. Therefore, imagination (想象力 xiǎngxiànglì) is important in appreciating (欣赏 xīnshǎng) Beijing Opera. With an actress (女演员 nǚyǎnyuán) holding a flower in her hand and looking around, you can picture her standing in a garden (花园 huāyuán) and looking at many beautiful flowers at that moment (那时 nàshí); with a boatman (船夫 chuánfū) holding a peddle (船桨 chuánjiǎng) in his hand and moving ups and down, you could see a boat (船 chuán) is sailing (航行 hángxíng) in the river with waves (波浪 bōlàng) rise and fall. Beijing Opera also has many other features (特点 tèdiǎn). 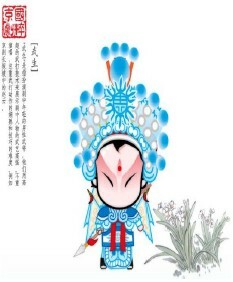 For example, it has unique (特殊的 tèshūde) costume (戏服 xìfú) designs while different color represents different social status. Facial makeup also uses color to express different characteristic: red as of loyalty (忠诚 zhōngchéng) and black shows blunt (鲁莽 lǔmǎng) and honesty (诚实 chéngshí). Well, it might take days and nights to introduce (介绍 jièshào) the full Beijing Opera to you, and you might still not get it. 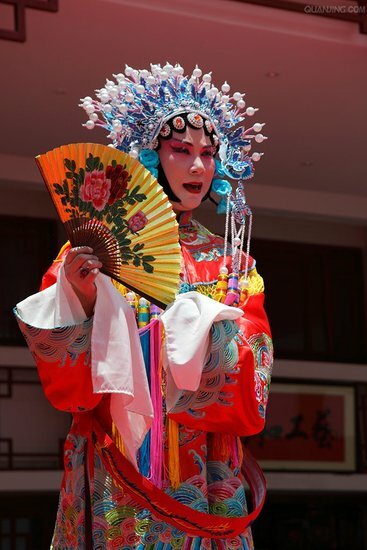 Why not having a try yourself to the real Beijing Opera. 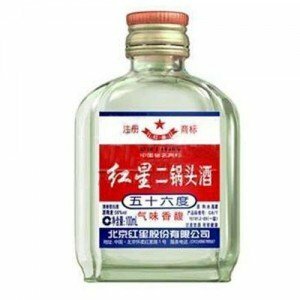 The quintessence of Chinese culture-See is believing (眼见为实 yǎnjiàn wéishí)!